Sepsis was named the most expensive disease to treat in U.S. hospitals in 2011, posing an estimated total cost of $20 billion annually. It became a Core Measure in October 2015, meaning it could be one of the twelve conditions chosen by Centers for Medicare & Medicaid Services (CMS) to be measured regarding value-based purchasing (VBP). 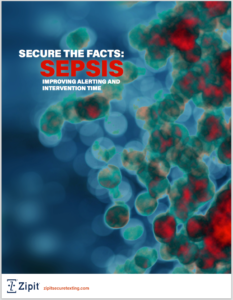 Below, we share some facts about sepsis and explain the opportunities for secure text messaging to improve sepsis alerting and intervention times, improve clinical collaboration, and ultimately help healthcare professionals improve patient care. When a two way, secure method of communication is used by both EMS and hospital teams, information such as patient symptoms and SIRS alerts can be transmitted and received prior to a patient's arrival in the Emergency Department, enabling better preparation and faster response. In addition, utilizing a single cloud-based messaging solution for communication between pre-hospital and ED teams enables full message archival, providing healthcare professionals with a way to review and analyze data to facilitate process improvements regarding treatment and intervention. To improve intervention time, secure messaging devices and smartphone applications can be used to communicate positive sepsis results to any and all appropriate parties for immediate assessment and intervention for the patient. 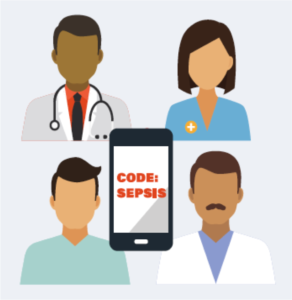 Secure texting solutions that also provide sophisticated messaging workflows enable Code Sepsis notifications to be simultaneously sent to multidisciplinary teams, and track acknowledgements and responses as they happen, enabling individuals such as sepsis coordinators to activate rapid response teams more efficiently. The bottom line for sepsis is that teams armed with knowledge, education, and protocols (and using the right communication tools) can improve timely intervention and improve a patient's outcome. For more information on how Zipit secure texting and priority messaging can assist healthcare providers in reducing fatalities and healthcare costs associated with sepsis, download our white paper, SECURE THE FACTS: Improving Sepsis Alerting & Intervention Time. Note: Someone from Zipit may contact you directly to follow up. Zipit Wireless provides HIPAA compliant secure messaging to healthcare organizations, emergency service providers and government agencies, enabling healthcare professionals to meet regulations and protect patient information while improving their overall efficiency and productivity. For more information on Zipit's secure texting with priority messaging, visit our Products page.